Losing a child is the absolute hardest thing anyone can ever go through. There are literally no words. From a Mom who has lost, here are ways to help. If you haven’t already, please read Part 1: What NOT to Say to a Parent Who Has Lost A Child please do so. That one, in my opinion, is far more helpful to those of us experiencing loss. I’m assuming that the reason we hear so many things that we feel are stupid is that people don’t know what to say and, ultimately, they hurt us. The funny thing is, there isn’t anything you CAN say. So just don’t. Check that post out, please! You wouldn’t believe how much well-meaning things stab when one has lost a child. This one, though, is for the ever so helpful loved one who wants to do something when we are in our grief. I stated in the first post that I have just lost another child. My first was 11 months and this one was 21. I understand what I went through but do not profess or assume that I understand how anyone else feels. We all grieve differently, need different things, these posts are based on my feelings and things that I’ve found helpful/hurtful as well as some insights I’ve gotten from other grieving parents. Let us cry. Just hug us and let it flow. Don’t say anything. There are literally no words, so just let it go. You can cry with us or if you are uncomfortable just stand there like a hugging stone wall, it doesn’t matter to us anyway. Bring food. I don’t mean the week or two after (though that is great), I mean a month later, 2 months later. 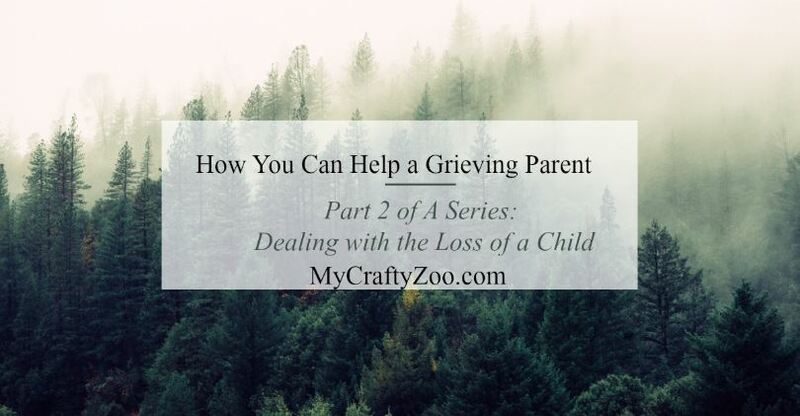 Grieving over a child is intense and takes a LONG time to get to where we can function. Many people bring food for the first two weeks and it seems like they think after that you will be ‘normal’ again. We’ll never be normal again and functioning normally takes a while to get to. Don’t greet us with sympathy, just don’t. Especially after a couple of weeks post-loss. If we happen to be at a day where we haven’t been bawling all day or greatly depressed, your sympathy (though well-meaning) will send us back there. Greet us like you always have. Don’t ask how we are. (see previous referenced post). When you do bring food, drop it off and make an excuse to leave. Don’t stay and try to chat, just go. For a while, we want and need to be alone in our grief and having to talk to people is overwhelming. We wanted nothing more than people to leave food at our door, bolt, and then just text and tell let them know it is there. See something that needs to be done? Try to do it without saying anything. Lawn need mowed, go by and mow it while we aren’t home if possible, then get out of dodge. Don’t say anything, just do it and go. If it’s someone whom you are close enough to have a key to their place, wait til they are gone and go by and clean. Again, don’t say anything just get it done and get out. You can tell them years later when they tell you about it or not, but don’t make us feel the need to express our appreciation. We’re exhausted. Text/email and simply say I love you. Don’t try to make conversation or say something that requires response. We’ll text/respond when we feel ready. If you want to send a card, don’t send a sympathy card. Send something to make us smile. Trust me when I say, we have plenty of things to keep us grieving and a sad card does NOT help. A smile, however, would be something few and far between so if you can find a hilarious ‘thinking of you’ card, go for it. It may seem tacky but trust me when I say, we need help smiling, not more sympathy. There is a difference between understanding and sympathy. On that note, be understanding. If we don’t want to go out/talk/whatever be understanding. Read the nonverbal cues and bow out when you sense that grieving parents need space or don’t feel like talking. If we feel like talking, be it anger or sadness, don’t think you have to respond, just let us vent. It’s cathartic, by definition. Trust me. Don’t avoid us. People don’t know what to say so they just avoid people. Commonly referred to as ‘giving them space.’ While yes, we do need it at times, we also need to know you are there. The trick is figuring out when those times are and sense we won’t tell you, I have not a single clue what to tell you to do to know when the need times are. Guess you’ll just have to pop in and check those nonverbal cues from time to time. While there is no time that is acceptable or unacceptable to wallow in one’s grief, if it seems like you or your loved one is going down a deep rabbit hole of depression, do something for them. Drag them out of the house if they were once social butterflies and are now hiding out, not to the bar but to a nice restaurant. Take them for a manicure. Do something that doesn’t require talking (unless they instigate it) about children, specifically theirs but really any, death, or any topic related. Though we love you and yours, we aren’t in a place where we want to see or hear about children. They are strong reminders that ours are gone and that pain is unbearable. Again, I hope these things help you to help yourself or someone else. There is no way you can ever really help someone’s grief. The only way you can help is to find ways to ease their other burdens. They say only time can heal, but my experience in this instance is that time does not heal. What happens is that we don’t heal, we simply learn how to live with the pain and, eventually, realize that it is okay to have moments of happiness. Knowing how to deal with depression may help, either you or them, and before My Princess went to Heaven, I wrote 10 Smart Strategies to Help Overcome Depression. This post was inspired by and written in Loving Memory of my Cajun Queen and My Princess. Two amazing and beautiful daughters whom I love so very much. Until we meet again, I will carry you both with me in my heart, always finding ways to honor your memory. Enjoy Heaven.